In the middle of the potty training dog juggling week of chaos, I flew to New Jersey for my sister-in-law’s bridal shower and bachelorette party and left Corey to handle all the things going on at home. It was such a nice Parisian-themed shower that even had a caricaturist. 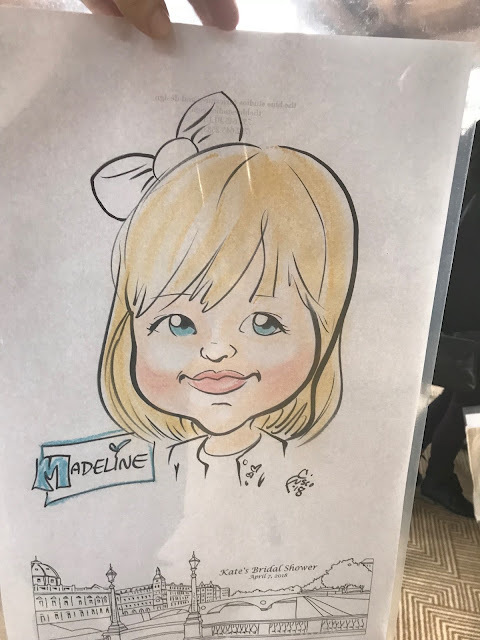 Instead of having her sketch me, I asked her to sketch Madeline from a photo I snapped in Easter. This was the first time I’ve flown by myself in years (probably since I was going back and forth from New Jersey) so it felt so weird to just have my carryon and purse. I was constantly feeling like I’d accidentally set down all the other travel paraphernalia that comes when you have kids. I made it home just in time for Madeline to be getting up from her nap on Sunday and spent a few hours with my girl. Then, Corey headed out of town for work on Monday and Madeline went back to preschool yesterday so we are back into our little routine again. The drawing is gorgeous. And yes on the flying alone. But doesn't it feel nice? Wahoo on potty training!! Peppa for the win.